Rioja is one of my all time favorite region of Spain. It is a classic that never ceases to bore me. There is always something new to discover or a glimpse of a detail that you did not see before. For me, it is like the films of acclaimed iconoclastic Luis Bunuel. This is a region that it is always re-inventing itself but always true to its origin. For my wine of the month feature, I choose the Riojas of Bodegas Fernández de Piérola. I had a chance to taste them in the Raspipav wine saloon last year. Their Crianza was in the top 10 of the Montreal Judgement 2014. The theme of last year was to select the wines with the best quality price ratio in the private importation segment of Quebec. This is a relatively new Bodega for Rioja time standards. It was founded in 1996 and they are situated in Moreda which is part of Rioja Alavesa. They are blessed with an optimal microclimate: Clay, chalky and ravinous soils with considerable differences in day and night temperatures. Their Pierola Crianza 2010 ( the one that i tasted) comes from vines over 30 years old. It displays wonderful notes of blond tobacco, black cherry with toasty oak and intriguing nuances of smoked black earth. It has an excellent structure with polished tannins and is quite elegant despite the fact that it spent 18 months aging in a mix of 70% american oak and 30% french oak. Their Reserva 2005 come from tempranillo vineyards between 45 and 60 years old. It has more powerful nose than the crianza displaying notes of jammy cassis, leather and lead pencil. On the mouth, it is quite potent and concentrated with ripe but massive tannins. It is quite oaky, but give it some time in a carafe and it will drink beautifully in a few hours. Or you can cellar for 10 years. 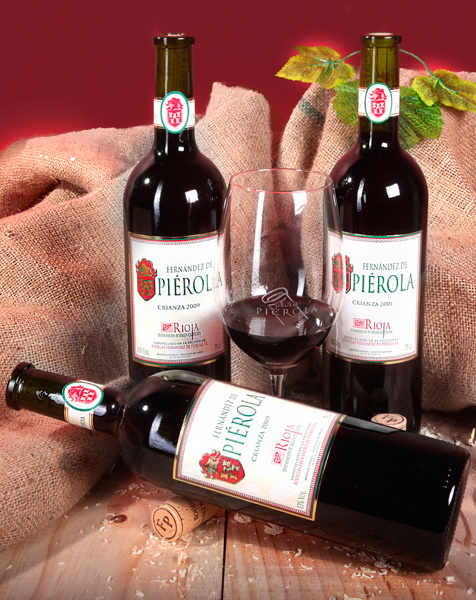 Pierola is represented in Quebec by MonCaviste. You can get their Crianza 2011 by the modest price of $21.70 per bottle in case of 12. Their 2005 retails for $33.60 and comes in cases of 6. These are perfect for the BBQ season at its full swing in these part of the world. Happy drinking and see you soon!!! This is my last instalment on the work of Alvaro Palacios in Spain. In my previous posts, I covered his work on the Priorat and Bierzo. On this final post, i will cover his recent work in the Rioja. By the way, the timing on this post is perfect. Alvaro Palacios was named man of the year 2015 by the wine magazine Decanter. After the death of his father in 2000, Palacios took the reigns of his family’s property and winery in Rioja, Palacios Remondo. Like his previous work in Bierzo and Priorat, Alvaro wants to create wines that raise an aesthetic emotion. Here i am quoting the words on his interview by Decanter magazine. According to him, he wants to pioneer a new style of Rioja by grafting Garnacha buds into Tempranillo vines and trellised vines into bush vines. The Palacios Remondo Estate and vineyards are situated at high altitudes in the eastern part of the region. Alvaro uses mostly Garnacha, which has found its perfect place in Rioja Baja, as the dominant grape in his cuvees. This makes Riojas of a more Mediterranean character. La Vendimia is a joven style of Rioja. This is a wine that has been aged in a mix of used and new oak tanks, american and french in style for 4 months. This is a blend of 50% Garnacha and 50% Tempranillo. The grapes are sourced from high altitude vineyards of 1800 feet. Grapes are organically grown for this and his other wines. Vendimia which means just vintage is the entry level of wine for the Remondo estate. with spices. A touch of garrique. Generous with a good tannic profile. Medium lenght finish. 92\100. On the other hand, La Montesa is a field blend of 70% Garnacha, 25% Tempranillo and the rest comprising Mazuelo. It is a wine made with a long maceration of 23 days and the wine has been aged in new and used 90% French and 10% American oak barrels. Palacios describes the 2011 La Montesa as ‘a wine that flows velvety smooth. mouth with an aftertaste that bring to vanilla bean and coffee. Drink now or keep for the 5-10 years. 92\100. Palacios also makes in the Remondo estate, the wines Plácet Valtomelloso and Propiedad. The former is the only white wine that Alvaro makes in his property. It is made with Viura. Plácet meaning to please. Propriedad is a pure Garnacha made from vineyards ranging from 25 to 90 years of age. The fruit sourced across five unique vineyards that are represented by five gold stars on the wine’s new label. The unique soil is composed of sediments that stem from the Quaternary Era, consisting of volcanic ophite and sandstone pebbles, quartz and white carbonates. According to Palacios, this is a very special soil that has been making legendary wines for hundred wines. I have not been able yet to taste these two wines, but plan to do so in the near future. What lies ahead for Remondo in the future?. Palacios have been working for a decade now in a wine called Valmira. This wine is made from 100% Garnacha grown in a three-hectare single vineyard that bears the same name at Palacios’ family estate in the village of Alfaro in Rioja Baja. Over the last 10 years, Palacios has been busy grafting low bush vines with Garnacha and uprooting the Tempranillo planted in the vineyard. According to him, it will be like a Gevrey-Chambertin in soul and character. It will be problably be like L’Ermita in Priorat or La Faraona in Bierzo. It will be problably carry too a hefty price tag since only 1300 bottles have been made for the 2013 vintage. In an interview for the Drink Business last year, Alvaro has stated that “Garnacha is the queen grape of Rioja Baja – it’s been there for centuries. Producers were wrong to uproot it for Tempranillo in order to make a quick buck,” Will this wine become a timeless classic in the Riojan wine tradition?. Only time will tell, but if it carries the Alvaro signature, more than half of the odyssey is done. The humble Spanish Omelette. Bring a piece of Spain to your kitchen. Italians have their pizza, Greeks have their Souvlakis and in the province of Quebec, we have the poutine. Perhaphs, the dish that represent the most the gastronomy of Spain is the humble tortilla de patatas or spanish omelette. Walk into any Spanish bar or restaurant from a major city such as Madrid or Barcelona to a town like Burgos and you will find this food staple. It will presented as tapa mostly. It is very rare to see it as main dish in a restaurant. It is said that the tortilla is born from a story of a man named General Zumalacarregui who was very hungry but and found himself at a farmhouse demanding food. The peasant who only had eggs and potatoes put the two together and made an omelette, resulting in the birth of the tortilla. However there are other theories about its origins. For example, across the Mediterranean and the Near-East, there are countless variations of what you cann call an omelette. Interesting this dish originated in Persia as the kookoo sabzi and then gradually moved west. In Turkey, it was called the Kaygana. In Italy, it evolved into the frittata. In France, of course the omelette and in Spain, it is the Tortilla Española or at times, the Tortilla de Patatas. A tortilla is best enjoyed with a young fruity wine. A Rioja crianza will do the job. If your tortilla has a a meat element such as chorizo or jamon, you can have a Rioja reserva or Ribera del Duero. If you are feeling in a very festive mood, why not a Cava. On a lazy weekday evening when you do not feel like cooking, you can make a delcious tortilla rather than take out. It will be cheaper and healthier too. Back in October when i started this blog, i tasted the wines of Campo Viejo. They have been making wine since 1959 in the Rioja. Campo Viejo is the child of two Spanish wine lovers, Beristain and Ortigüela. They make that embodies the embodies Riojan wine traditions. For everyday weekday drinking their wines deliver amazing value. Campo Viejo Rioja 2012. Price: $15.35. SAQ Code: 11462446. In Spain, the two main classic wine regions are Rioja and Ribera del Duero. Over the years, a friendly rivalry has developed between these two years. Often, the two regions are compared against each other. In this post, i will try to shed some light between the differences between these two giants. Rioja became the first Spanish wine region to get doc status in 1925. In 1991, they received the most prestigious Denominación de origen Calificada (DOCa) which is very similar to what the italians call DOCG. In contrast, Ribera del Duero 1982 (It was called then Ribera de Burgos). In legal terms, Rioja is older than Ribera del Duero. Ribera does not posses the DOCa but many experts suggest that they should grant them, since it exist an historical quality precedent. The geographical area of the DOC Rioja comprises the municipalities of Rioja and the basque country, with some areas of production in Navarra. The principal production areas are Rioja Alta, Rioja Baja and Alavesa. Naturally, the terroir and climate is taken into consideration to define the boundaries of each area. The D.O. Ribera del Duero is located on the southeast part of Castilla and León, particularly in the provinces of Burgos, Segovia, Valladolid and Soria. The most important cities in this D.O are Aranda de Duero, Peñafiel, Roa and San Esteban de Gormaz. Rioja Alta has clay and chalky soils with a moderate continental climate. Rioja Baja is drier with a semi mediterranean climate and the soils are again clay type but with a rich mineral character that recalls iron. Rioja Alavesa has moderate winter temperatures with low incidence of frosts and a landscape consisting of an abrupt orography and chalky soils. To resume, the soft temperaturates of Rioja permit a slow ripening of the grapes. On the other hand, Ribera del duero has a climate characterized by low rainfall and extreme temperatures that combine the cold winds of the winter with the dryness of the summer season. As a consequence, the ripening of the berries will be less, making highly aromatic and concentrated wines but at the expense of finesse. The D.O. Ribera has very diverse soils. In the part with the highest altitude, there is a mixture of limestone and chalk. In the mid-slopes sand and clay. In the lowest part just limestone. In Rioja with regards to the grapes authorized , there are four red authorized:(Tempranillo, Garnacha tinta, Mazuelo and Graciano) and three white varietied (Viura, Malvasía and Garnacha blanca). However Tempranillo is king on those parts. On the other hand in Ribera del Duero,Tempranillo, Cabernet, Sauvignon, Merlot and Malbec are authorized,Garnacha and Albillo as well but in small quantities. Like in Rioja, the most important variety is Tempranillo. Rioja has white, red and rose wines while Ribera del Duero only make red and roses. Rueda does not count, although it is considered by some as a satelite of Ribera del Duero. In both DOC’s, traditionally wines have been classified according to their aging requirements: jóvenes (no aging in wood), crianza (minimum 2 years aging, one of them in wood), reserva (minimum 3 years aging, 2 in wood and 1 in bottle).Gran reserva (minimum five years, 2 in wood and 3 in bottle). Tinto Pesquera Ribera del Duero. $43.50. Saq Code: 10273088. Very aromatic nose displaying black fruit paste, moka and dark chocolate notes. In addition, notes of seasoned wood. In the mouth, full body. Highly structured with firm and austere tannins. Complex flavors come to mind ranging to ripe black fruits, graphite, tanned leather to indian spices. Very long finish. 94/100. Bodegas Tobia-Modern Riojas with soul. At the late Raspipav, I saw little Spanish presence, but what i tasted was really interesting. One of these producer is Bodegas Tobia is a newcomer in the Rioja. The bodega was established in 1994. Its founder and hombre fuerte is Oscar Tobía, This Spanish gentleman comes from a local family of wine growers situated in San Asensio. His purpose is to make original and distinctive wines which embodies the spirit of Rioja but with a modern twist. Tobia is the pioneers of barrel fermented rose in Rioja. To this say, Oscar continues to produce innovative wines which are widely known around the world, and sometimes used as benchmark examples by the Rioja Institute. It is great to know that we can find Riojas of this caliber in the province of Quebec. Tobia is represented by Benedictus agency. They have a small but very interesting Spanish Portfolio. I only had a chance to taste 3 of their wines at the latest Raspipav in Montreal, Quebec. Although their wines are modern, they are quite enjoyable. I love the fruit concentration profile and the oak is present ( seleccion and daimon blanco). However, nothing is out of balance. It is very harmonious. However, the most interesting wine was the Daimon blanco, since it contains an unusual grape, Tempranillo Blanco that we seldom see in Rioja. Accordng to Dinastia Vivanco,”Tempranillo Blanco offer intense fruity aromas, with banana, green apple, citrus and floral characters”. You can read about this and the other grapes on Rioja on the Rioja DOCa site. Tempranillo Blanco, or White Tempranillo, is a relatively ‘new’ grape. It is the result of a natural mutation of the more common ‘red’ Tempranillo, and was discovered on a vine in a vineyard in Murillo de Rio Leza in 1988 by the owner, Jesús Galilea Esteban. DNA analysis proved that this really was tempranillo, but it had a natural ‘albinism’ that had affected the genes responsinble to the skin colour that resulted in a yellow/green skin pigmentation instead of the usual blue/purple. Tobia 2013 Tinto $18.70. 100% Tempranillo destemmed, cold maceration in CO2. Stainless steel tank fermentation. No oak. Beautiful primal tempranillo fruit ( Panoply of red fruits ). In addition, spices and licorice. In the mouth, full body with an excellent structure. Tobia Seleccion 2010. $26.90. Mostly tempranillo with blend with Garnacha and Graciano. Aging in american and french oak barrels. The vintage 2008 was aged nineteeen months. On the nose, concentrated aromas of jammy black fruit. Spicy with well integrated wood notes. Structured and dense with vanilla and pepper layers. Very long but austere finale. 93/100.